Torrey House Press, 9781937226831, 312pp. 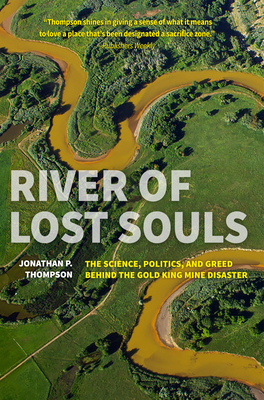 Award-winning investigative environmental journalist Jonathan P. Thompson digs into the science, politics, and greed behind the 2015 Gold King Mine disaster, and unearths a litany of impacts wrought by a century and a half of mining, energy development, and fracking in southwestern Colorado. Amid these harsh realities, Thompson explores how a new generation is setting out to make amends. As shocking and heartbreaking as the Gold King spill and its aftermath may be, it's merely the tip of the proverbial iceberg. The disaster itself was the climax of the long and troubled story of the Gold King mine, staked by a Swedish immigrant back in 1887. And it was only the most visible manifestation of a slow-moving, multi-faceted environmental catastrophe that had been unfolding here long before the events of August 5, 2015. Jonathan Thompson is a native Westerner with deep roots in southwestern Colorado. He has been an environmental journalist focusing on the American West since he signed on as reporter and photographer at the Silverton Standard & the Miner newspaper in 1996. He has worked and written for High Country News for over a decade, serving as editor-in-chief from 2007 to 2010. He was a Ted Scripps fellow in environmental journalism at the University of Colorado in Boulder, and in 2016 he was awarded the Society of Environmental Journalists' Outstanding Beat Reporting, Small Market. He currently lives in Bulgaria with his wife Wendy and daughters Lydia and Elena. Jonathan Thompson has been an environmental journalist focusing on the American West since he signed on as reporter and photographer at the Silverton Standard & the Miner newspaper in 1996. He has worked and written for High Country News for over a decade. He currently lives in Bulgaria with his wife Wendy and daughters Lydia and Elena.